Confession: I HAVE GOLD STAR SYNDROME. Hi. My name is Lindsay, and I secretly collect gold stars. 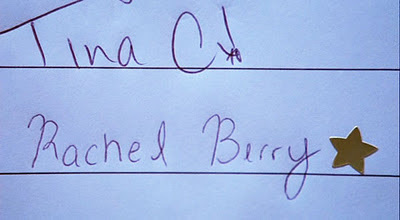 I have an inner Rachel Berry, though not nearly as neurotic or narcissistic -- or so I'd like to think. 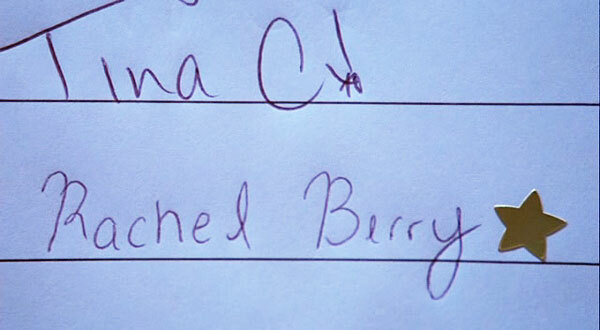 Glee's Rachel Berry puts a gold star sticker next to her name. Reason? See next photo. Such a defining line for her in the pilot episode! I love doing things right, and I love when they're acknowledged. I've been this way for as long as I can remember. Is that so bad? I'm a well-rounded person, but I've never been the best at anything. I always try my best, and it generally lands me in the realm of "Very Good" but not "The Best." However, I was one of those lucky kids who was encouraged daily. I had amazing teachers who challenged me and nurtured whatever academic skill they thought I possessed. My dance teachers and vocal coaches gave fair criticism and wanted me to succeed. My parents left "We're so proud of your accomplishments" notes on my bathroom mirror. So what happened when I got older and the recognition and verbal gold stars dissipated? I had to tell myself. (And my parents still do too.) There have been times when I felt like I put a lot of work into something that went unnoticed. And even more frustrating, there have been times when I felt like someone else was recognized for something menial and far smaller. (Argh!) But you know what? That's okay! I've learned that as long as I genuinely put my best into everything, I'll be awesome at life. And that's way better than getting a "good job" gold star from someone else. Agreed? I love this post!! I definitely suffer from the same syndrome. I'm getting better... I think?